Update April 2: Thank you to Shirley for giving Missy a forever home! Edward loves Missy, but he can no longer care for her during his illness. He and his daughter would like to find her a new, loving home where she will be comfortable in her golden years. 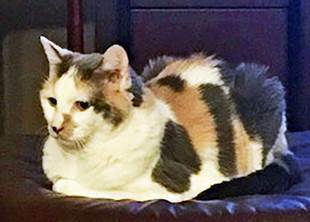 Missy is a 15 year old Calico short-hair. She is spayed and declawed in the front. As an indoor cat, she does not like to leave her familiar surroundings and loved ones. She likes to stay in her room and leaves to explore, periodically. Please help provide peace of mind for this family by helping spread the word to get Missy adopted. Hope can help you with start up costs and supplies.